Shriners, or Shrine Masons, belong to the Ancient Arabic Order of the Nobles of the Mystic Shrine for North America (A.A.O.N.M.S.). The Shrine is an international Fraternity of approximately 500,000 members who belong to Shrine Centers throughout the United States, Canada, Mexico and Republic of Panama. Founded in New York City in 1872, the organization is composed solely of Master Masons. The Shrine is best known for its colorful parades, its distinctive red fez, and its official philanthropy, the Shriners Hospitals for Children, which is often called “the heart and soul of the Shrine.” Members of the Ancient Arabic Order Nobles of the Mystic Shrine for North America are members of the Masonic Order and adhere to the principles of Freemasonry — Brotherly Love, Relief and Truth. Freemasonry dates back hundreds of years to when stonemasons and other craftsmen on building projects gathered in shelter houses or lodges. Through the years these gatherings changed in many ways until formal Masonic lodges emerged, with members bound together not by trade, but by their own wishes to be fraternal brothers. There is no higher degree in Freemasonry than that of Master Mason (the Third Degree). The Founders of the Shrine knew they needed an appealing theme for their new Order, so they chose the Arabic (near East) theme. The most noticeable symbol of Shrinedom is the distinctive red fez that all Shriners wear at official functions. Shriners are men who enjoy life. They enjoy parades, trips, circuses, dances, dinners, sporting events and other social occasions together. 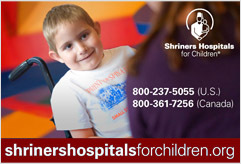 Furthermore, Shriners support what has become known as the “World’s Greatest Philanthropy”, Shriners Hospitals for Children. Through fellowship and philanthropy, Shrinedom strengthens the soul and adds inner-meaning to daily life. It thus spreads a glow of joy through one’s entire family. Men from all walks of life and all levels of income find fun, fellowship and relaxation in their individual Shrine Centers and its activities. There are also regional Shrine Clubs in many communities. Family picnics, dances and scheduled day trips are — just a few of the activities available to club members. For the Noble desiring even more activity, there are various Units that he can join, such as: Motor Patrol, Brass Band, Oriental Band, Motor Patrol, Horse Patrol, and Clown unit. Every effort is made to be sure a Noble has a variety of activities from which he may choose. There are 191 Shrine Centers located in the United States, Canada, Mexico and the Republic of Panama. And there are informal Shrine Clubs located all around the world. Why Do Shriners Wear a Fez? The red fez with a black tassel, the Shrine’s most distinctive symbol, has been handed down through the ages. It derives its name from the place where it was first manufactured – the holy city of Fez, Morocco. The fez was chosen as part of the Shrine’s Arabic (Near East) theme, around which the color and pageantry of the Shrine are developed. What is Masonry and What is its Connection to the Shrine? In order to become a Shriner, a man must first become a Master Mason. The fraternity of Freemasonry is the oldest, largest and most widely known fraternity in the world. It dates back hundreds of years to when stonemasons and other craftsmen on building projects gathered in shelter houses, or lodges. Over the years, formal Masonic lodges emerged, with members bound together not by trade, but by their own desire to be fraternal brothers. The basic unit of Masonry is the Blue Lodge, where members earn the first three Masonic degrees. There is no higher degree than that of Master Mason (the Third Degree), but for those men who wish to further explore the allegory and symbolism learned in the Blue Lodge, the Scottish Rite and York Rite elaborate on the basic tenets of Freemasonry.